Shown is an original & historic old newspaper, offered to enhance your collectible interest: NILES' WEEKLY REGISTER, Baltimore, Sept. 24, 1836 * Commonwealth v. Aves * Boston slave girl - Med Slater * Transportation of slaves The ftpg. has an item on the interment of Aaron Burr's remains. 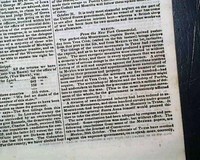 Inside has four pages of text concerning: "The Boston Save Case", being the case of the slaver girl Med. See Wikipedia for much more on this historic case, which established a precedent in law that slavery was local & liberty general. This precedent was widely appealed to by antislavery forces in their future litigation. Terrific detail in this report. Also in this issue: "Volunteers For Texas". Sixteen pages, 8 1/4 by 12 inches, bit of light damp staining, good condition. 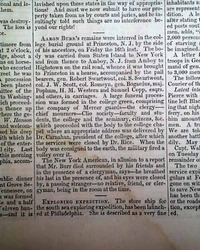 Shown is an original & historic old newspaper, offered to enhance your collectible interest: NILES' WEEKLY REGISTER, Baltimore, Sept. 17, 1836 * Aaron Burr death * Slavery in the Southwest * Native Americans - Indians The front page has over half a column concerning the recent death of Aaron Burr, with much detail on his life. 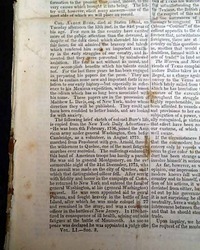 Within the issue are: "Removal of the Creeks--Official" "The Indian War" "Slavery in Texas" which takes 1 1/2 pages; "Letter from General Jackson: signed in type: Andrew Jackson; "Letter from Gen. Harrison" signed; Wm. H. Harrison; "Mr. Tyler & Slavery in the District of Columbia" and much more. Sixteen pages, 8 1/2 by 12 inches, bit of foxing, nice condition. 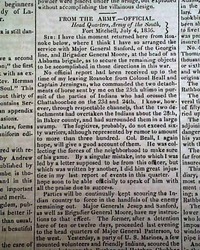 Shown is an original & historic old newspaper, offered to enhance your collectible interest: NATIONAL GAZETTE & LITERARY REGISTER, Philadelphia, July 23, 1836 * Fort Mitchell, Alabama * Texas War for Independence * General Winfield Scott Page 3 has: "From The Army--Official" which is a report from Fort Mitchell (Alabama) & signed in type by: Winfield Scott, concerning various actions with the Indians. 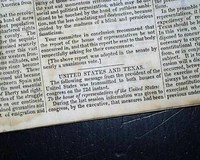 Also: "Texas" which mentions: "...to negotiate an exchange of prisoners had been seized by the Mexican authorities & imprisoned. 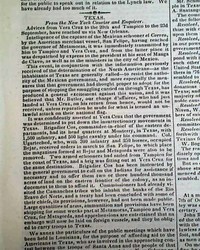 The Mexicans positively refuse to enter into any treaty with the Texians..." with more (see). 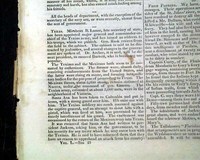 Four pages, never bound nor trimmed, minor fold foxing, nice condition.